This activity is intended for medical oncologists, hematology-oncology fellows and other healthcare providers involved in the treatment of melanoma. Between the 1960s and the 1990s, the incidence of melanoma and the mortality rates associated with this disease rose precipitously in most developed and industrialized nations around the world. Despite increased awareness of this phenomenon and extensive attempts to publicize risk factors and screening, current estimates suggest that 68,130 men and women were diagnosed with melanoma and 8,700 individuals died from the disease in 2010 within the United States alone. Although most patients with in situ or early-stage melanoma may be cured by primary excision in the absence of systemic therapy, the prognosis of patients with metastatic melanoma remains poor. The disappointing impact of existing interventions on clinical outcomes in Stage IV disease has resulted in a need to continue to investigate novel treatment options for patients. Novel treatments exploiting the biologic and genomic characteristics of melanomatous tumors have made this disease a fertile ground for application of emerging systemic therapeutics. This program uses a review of recent ASCO papers and other relevant publications, faculty case presentations, Q&A, discussion of community practice patterns and a melanoma pathology tutorial to assist practicing clinicians with the incorporation of investigational findings from the multitude of diverse ongoing trials into routine clinical care. Use case-based learning to individualize the care of patients with metastatic melanoma. Communicate the benefits and risks of ipilimumab-based therapy to appropriately selected patients with advanced-stage melanoma. 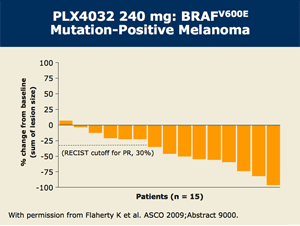 Recall emerging data with BRAF inhibitors in the targeted treatment of melanoma, and identify how these agents may affect diagnosis and management of the disease. This CME activity consists of two video components. The participant should watch the videos. Advisory Committee: Bristol-Myers Squibb Company, Eisai Inc, Genentech BioOncology; Consulting Agreements: Cephalon Inc, GlaxoSmithKline. Advisory Committee: Bristol-Myers Squibb Company, Celldex Inc, Genentech BioOncology, Novartis Pharmaceuticals Corporation; Consulting Agreement: Bristol-Myers Squibb Company; Stock Ownership: Celldex Inc. This program is supported by educational grants from Bristol-Myers Squibb Company and Genentech BioOncology. Email from the Moderator: ASCO president George Sledge commented in Chicago that this was the “year of melanoma,” but for many of us the light bulb went off that big things were to come in this disease at ASCO 2009 when Keith Flaherty fired up a jaw-dropping waterfall plot from a Phase I-II study evaluating an agent that at the time simply had a bunch of letters and numbers as its name (PLX4032 — now vemurafenib). The momentum continued last year as, for the first time in ages, melanoma was front and center on the ASCO plenary stage as Steven O’Day wowed the masses with a data set on a completely different antimelanoma management approach — immune-based manipulation using ipilimumab, an agent that has subsequently been approved by the FDA. The Phase III study presented during the plenary session by Jedd Wolchok evaluated DTIC alone or in combination with — as Keith calls it — “Ipi,” and although the impact on short-term variables like response rate and PFS were modest, as seen in prior studies, 20 to 30 percent of patients experienced prolonged survival. Related to this phenomenon, on our webcast Dr Weber presented a 32-year-old patient receiving Ipi on trial who experienced a complete response and is alive and well eight years later. Currently there are no specific clinical or tissue predictors of benefit with this interesting antibody that “blocks the brakes” on T-cell activation, but of particular note is a diverse array of potential immune-related treatment complications. These include a bothersome colitis that both investigators emphasized must be treated promptly with corticosteroids rather than medications like Imodium, pruritus, which can usually be managed with topical corticosteroids, and more uncommonly hypophysitis that may present clinically as fatigue and/or more specific endocrine manifestations. Interestingly, during an unrelated audio interview I conducted with Dr Wolchok on the same day as the webcast he discussed a patient responding to Ipi who was experiencing decreased libido. Sure enough, the patient had pituitary enlargement on MRI and a hypopit endocrine profile. One of the exciting new “ibs” discussed in Dr Sledge’s presidential address, vemurafenib is restricted to the 40 to 60 percent of patients with melanoma harboring a BRAF V600E mutation. As was seen in the plenary data set comparing it to DTIC, many of the treated patients experienced objective tumor shrinkage, although this may be short-lived due to a multitude of other mutations that allow the tumor rather than the patient to survive. During the broadcast, both faculty members showed scans from individuals who clearly benefited from this agent, and one strategy being discussed for future trials for patients with BRAF mutation-positive tumors is the combination of Ipi and V-mib. To continue the story of melanoma agents with unusual toxicities, vemurafenib and other V600E BRAF inhibitors not infrequently cause the relatively rapid development of skin keratoacanthomas and actual squamous cell carcinomas. Keith noted that there is a logical biologic explanation for this observation in terms of upregulation of a complementary tumor-activating pathway, and at ASCO the “king of dermato-oncology,” Memorial’s Mario Lacouture, demonstrated that many of these secondary lesions contain RAS mutations. Jeff and other investigators recommend that patients on BRAF inhibitors (there is at least one other in development with reported objective responses) have regularly scheduled follow-up physical exams and be promptly referred to a dermatologist for any new skin lesions. Although vemurafenib is currently not approved, the faculty speculated on how they might go about sequencing it with Ipi for patients with BRAF mutation-positive tumors if and when the drug becomes available. Jeff felt that the impressive waterfall plots may motivate practitioners to turn to the “ib” first, but for patients who are clinically stable and not in need of immediate tumor response both faculty members believe that Ipi is an equally logical up-front choice. Other strategies that may soon follow include trials of these interesting molecules in the adjuvant setting, and in that regard, please click here for a pathology video tutorial with Dr Adriano Piris on primary melanoma and prognosis. Next up on our webcast summary series, we review ASCO data sets and faculty cases related to Dr Sledge’s prototypical “smart cancer,” non-small cell lung carcinoma, which was discussed during our most recent RTP TV broadcast this past Tuesday night.